It’s not unusual to have aches and pains throughout your body as you age. But, there are ways to keep those minimal. By maintaining the health of your knees, you can avoid mobility issues in your older years — and prevent debilitating knee injuries. Sometimes old injuries that occur when you’re young can also come back to haunt you later in life. While you cannot change what happened in the past, there are some things you can do to keep your knees operating at their best. Shoes can have a significant impact on the health of your knee. If your shoes force your feet to roll to the inside or outside, or if you suffer from fallen arches, you could put extra strain on your knees. Orthotic inserts can correct these types of issues — removing pressure from the knee. If you can, don’t wear high heels for too long at a time — they’re known to cause osteoarthritis in the knees. Your body needs exercise, but exercising too much or overcompensating on the weekends because of inactivity during the week isn’t a good idea. Overloading your muscles, joints, ligaments, etc. can lead to micro-tears inside your knee. As time goes on, these small tears can become big problems. To the new or returning athlete or gym-goer, work up to your workouts. Take it slow as you incrementally increase time and intensity to your workouts so you don’t injure your knees. For avid athletes who are really engaged in one or just a few sports, it’s not uncommon for me to see the same injuries over and over. This is not just because of overuse due to the sport, but often because you are mainly working out in one plane, sagittal, or going forward. Your muscles are often over strengthening in the sagittal plan when you could keep knee pain away if you started to strength train in other planes. If you are a runner or cyclist, you can keep painful knee and leg conditions down by adding more side to side strength training. When you are overweight, the extra pounds cause strain on your knee joints. Avoid activities that put extra pressure on the knees —such as running — while you are overweight. Instead, take up activities that help you lose weight, such as cycling or swimming, but don’t overwork the knee. For more check this out. Not exercising enough or with the right body balance is often a big problem with the knees. A tight muscle doesn’t mean it’s a strong muscle. A loose muscle doesn’t mean it won’t be a problem. The muscles around your knee have to maintain an optimal length so they can pull at their strongest. When a muscle is overstretched (usually due to imbalance in the body), it has to do a lot more pulling to get to its totally contracted point. When a muscle is too tight and constantly contracting, it’s starting from a weak point because it can only contract so much more; it has a length that doesn’t change, but the amount of constantly contracting fibers can change. Balance in the body is what helps your knees stay pain free and the muscles stay healthy and strong. Stretching before you exercise — especially in the hamstring, quads, hip flexor and oblique areas—can help support your knees. Even if you aren’t working out, you should stretch these areas daily. Women are more prone to stress on their knees; therefore, having a daily routine of stretching could be good for your body. Stretching always helps, but doesn’t always take care of why there is an imbalance. Chiropractic adjustments helps take care of the structure under the muscles (your boney body frame) as well as helps preserve the healthy nerve conduction into and out of the spine which makes you feel all over good and your muscle contract their strongest. Adjustments are often exactly what the muscles need to stop getting pulled or having to work too hard to do the pulling. When your spine is misaligned, it can cause extra strain on your knees. Regular chiropractic appointments have been shown to improve strength in the sacroiliac joints. Also, regular adjustments can take the strain off your knees and increase your overall range of motion. If you want to keep your knees healthy, schedule an appointment with Dr. Nicole Muschett, (your Bethlehem, PA Chiropractor) today for a no obligation consultation. Or get access, today, to our free report, “10 Questions to Determine if you are Heading Towards a Foot, Ankle or Knee Injury and How to Prevent it”. You are in touch with your body, but do you know how the nerves in your body actually work? These circuits run throughout your body — and when one becomes pinched or compressed, they can cause tremendous pain. Neural pathways can become a chronic source for pain in some people. If you have been suffering from chronic pain because of a pinched or compressed nerve, there is hope. But, first you must understand how your nerves work. Nerve impulses are electrical signals sent by your brain that travel along the nerve channels throughout your body. The signals help your body’s cells communicate with muscles, tendons and other portions of your body. Your nerves are what make you feel pain, temperature differences, see what is around you, hear, and even move. Inside your nerves are specialized types of cells, known as neurons that carry the signals. Inside your neurons are somas, which are about 4 to 100 micrometers in diameter. From these come the dendrites — tiny tendrils that span out from the soma. 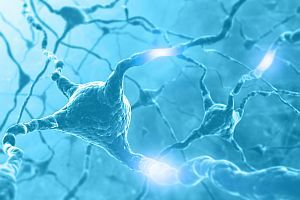 Dendrites receive the signals sent from other neurons in the body. From each soma, there is an axon — a long channel that sends out the signals to other neurons. Neurons and their signals are super fast. In fact, one signal can pass from the brain to your feet within 20 to 200 milliseconds — as long as your body is operating right. This is what makes your body react quickly in situations such as jumping to avoid something or reaching out to brace yourself for a fall. As nerve impulses move along channels in your body, their charges change and they develop electrical energy, which is measured in millivolts. Positive and negative charges of the neurons are what create the neuron signal. When the cell membrane outside of the soma is stimulated by these charges, it opens the chemical gateways in the body — allowing positive ions to enter the axon. If you suffer a physical injury and it damages your body’s nerve channels, you could feel extreme pain, muscle tension and radiating nerve pain out to other areas of your body. The same can occur with drug interferences, but instead of pain, your body will be numb because the toxins or chemicals are interrupting nerve channels. Toxins, like snake venom or local anesthetics, can actually stop nerve signals from being sent across the channels — preventing you from feeling pain or controlling your muscles. Without nerve impulses, no one would survive. These essential parts of your body’s wiring are what help you recognize the world around you, react and protect your body. Neurons and nerve transmissions are an essential part of your body’s function — and they can let you know when something goes wrong. When a nerve becomes compressed, you can suffer from extreme pain and discomfort. Some patients suffer from limited mobility, and the pain can be so debilitating they cannot do daily tasks. If you’re suffering from nerve pain or nerve conditions, Dr. Nicole Muschett, your Bethlehem, Pennsylvania Chiropractor, can help you uncover what you need. Meet with her for a no obligation nerve pain consultation and see what treatment options are available for your condition.